Installing ceiling speakers is one of those home improvement projects that is feasible for a determined do-it-yourselfer, but results in something with a professional, custom-quality look. It is a trim and tidy way to save space, reduce the clutter of tangled wires and create a top-notch sound system for your home theater or stereo. Ceiling-mounted speaker systems generally come as a kit with detailed instructions and all the necessary hardware (other than speaker cable). The following steps are a general guide that will help to clarify the process for the installation of any type of ceiling speakers. Just keep in mind that the hardware provided will vary based on the product. Ceiling speakers come in left and right pairs which should be positioned in a symmetrical layout, generally within a few feet of a wall rather than out in the middle of a room. For example, you may have a pair of front speakers that is 3 feet in from the wall closest to the stereo, with each one 3 feet away from the left and right walls as you're facing the stereo. Rear left and right speakers would then be located in a similar fashion off the back wall. Obviously, you'll want to steer clear of light fixtures and other objects that are already mounted in the ceiling. It's very important to choose a location where there are no ceiling joists. A studfinder makes it easy to determine the exact location of each joist, but you can also knock on the ceiling and listen for the hollow sound that indicates that the space behind is between the joists. Ceiling speakers are generally circular and come with a template that you can use to cut the hole in the proper shape and size. You will also need to cut a smaller rectangular hole for the box near floor level where you will plug in the stereo system. This resembles a typical electrical outlet and makes a clean transition for the speaker wire to pass through the wall. Make a small X at the center point for each speaker location. Align the center hole of the template with the X and trace the shape of the cutout with a pencil. Drill a 1/2-inch hole in the ceiling at the X. Push the tip of a sheetrock saw into the hole and cut toward the circular outline in a gentle arc shape, continuing to cut around the entire outline until the circular piece of sheetrock can be removed. Repeat the process to cut a rectangular hole for the speaker wire jack somewhere in the wall adjacent to the stereo receiver. Measure the length from the hole for the speaker wire jack to the ceiling and over to the location of each speaker. Add several feet to each measurement to give some wiggle room for the installation and cut speaker wire for each length. Using a strip of duct tape and a permanent marker, label each wire at both ends as front/right, rear/left etc. 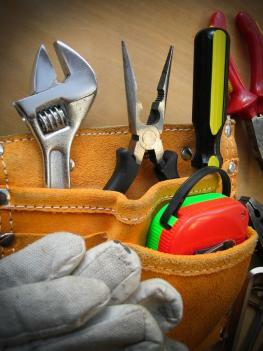 Drill holes through any studs or joists that the wires will need to pass through using a 1/2-inch or smaller drill bit. The holes should always be in the center of the wooden member, so as not to weaken its structural integrity. Use a fish tape to pull each wire through from the jack location to each of the speaker locations. Start by pushing the tape through from one of the speaker locations to the wall jack location. Bind the appropriate piece of speaker wire to the end of the fish tape using electrical tape and then pull it through from the other end. Repeat the process for each speaker location. Attach the wires to the studs and joists where possible using hammer-in wire clips, keeping it taut between each clip. Each system will have its own hardware for connecting the speaker cable, but there are a couple of steps that are common to virtually all of them. Strip 1/2-inch of the sheathing off the ends of each of the wires. Connect the positive and negative leads from each wire to the corresponding positive and negative terminals on the back of the wire jack and each of speakers. Positive leads go to red terminals and negative leads go to black terminals. Plug in the short speaker wires that go from the stereo to the jack and turn on the system to makes sure it works before proceeding. There are a variety of brackets and other hardware used to mount the wall jacks and ceiling speakers, but most involve a method for clamping the unit to the sheetrock to hold it in place. Because of their shape, these are often called 'dog leg clamps' and they are generally made tight with a screw that is inserted through the front face of the speaker or wall jack housing and into the clamp, sandwiching the sheetrock tightly between them. There is always a cover plate that goes on at the end to conceal the wiring of the jack and protect the speaker from damage. The cover also extends out to conceal the ragged edge where the sheetrock was cut, making for a clean, professional-looking finish. Here are some tricks of the trade to help you install your ceiling speakers safely and with minimal hassle. Before getting started, it's always a good idea to go up in your attic and take a look around to strategize about potential speaker locations. You want to make it as easy as possible for yourself in terms of accessibility from inside the attic and minimizing how many studs and joists you have to drill through. If you want to install ceiling speakers in the bottom floor of a multi-story home, you may want to consider hiring a professional. It is much easier to run the wiring through the wall and ceiling if you can access it through the attic. 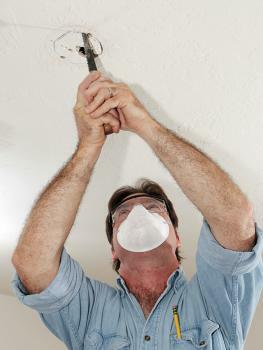 Running wire between a ceiling and floor can quickly become a bigger project than you anticipated. In general, if you're not comfortable operating power tools or you don't understand the basics of wiring - or are just not mechanically-inclined - this is probably not the project for you. 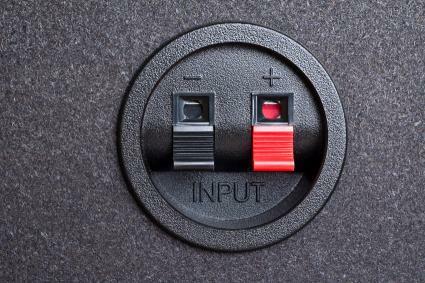 Always turn off the power to the room where you are working at the circuit breaker before drilling into the wall, just in case there happens to be an electrical wire behind the wall. After drilling each hole, insert a wire coat hanger with a 90 degree bend in it to probe around for anything that might be behind the wall (wires, pipes, wood blocking etc.) that would be in the way of installing the speaker or wire jack. When you start poking around in the attic and behind your walls, you'll notice there are already places where studs and joists have been drilled through for the 120V AC wiring that provides electricity throughout the house. 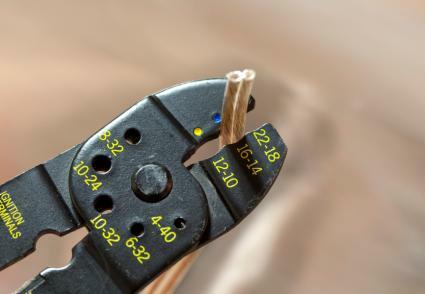 It's tempting to run your speaker cable through the same holes, but building codes do not allow for low voltage DC wire to be bundled together with 120 volt AC wire. 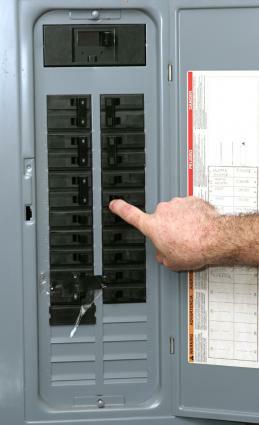 This can also cause electrical interference that will reduce sound quality. Each pair of speakers should have an equal length of wire running to them for best sound quality, even if one is closer to the source than the others. 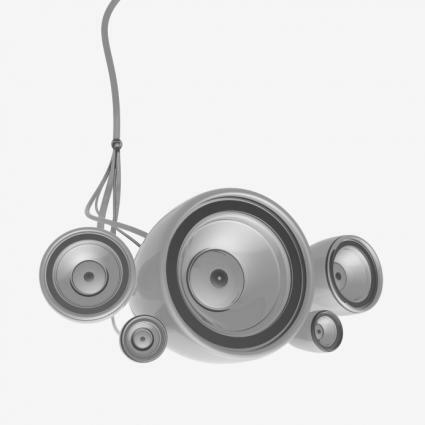 Front and rear speaker pairs are designed for different lengths of wire, but if the right and left speakers of each pair have a different length, the sound will be delayed to one of them causing distortion. In general, it's recommended that the right and left speakers of each pair be about 6 to 10 feet apart. Finally, it's important to cover the back of each speaker with a piece of fiberglass insulation so the sound is not escaping into the attic. The front cover of ceiling speaker are designed to be removed and painted, if desired, to match the color scheme of the room. 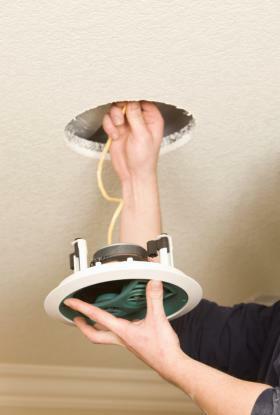 It's just one of the many little ways that ceiling speakers are a good fit for a finely-crafted custom home.